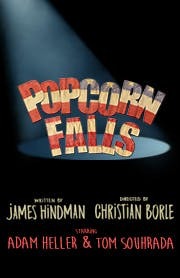 Welcome to Popcorn Falls, a small American town whose only claim to fame - their namesake waterfall - has dried up. Now bankrupt, their last chance is a large grant that can only be used if the town produces a play in a week. One big problem: no playhouse. Another problem: no play. Led by the Mayor and the local handyman, the enterprising townsfolk try to rise to the challenge and prove that art can save the world.